The Ancient Order of Hibernians calls on national retailer Walmart to immediately cease the sale of defaming merchandise targeting Irish Americans. Among items being sold are T-Shirts with such phrases as “I may not be Irish, but I Can Drink like One” and “Blame the Irish for My Behavior”. These items are an outrage to those whose Irish Heritage traces to hard working Irish immigrants, not to a beer bottle, and seek in March, which is Irish American Heritage Month, to see their culture celebrated, not used as an excuse for aberrant behavior. “We noted and applauded when Walmart recently took a very public and principled stand against ethnic slurs in ending its relationship with Paula Deen in response to Ms. Deen’s offensive epithets directed toward members of the African American Community. However, in carrying merchandise promoting negative stereotypes and reflecting a bigoted view of Irish Americans, we find Walmart guilty of the same offense and no little hypocrisy. 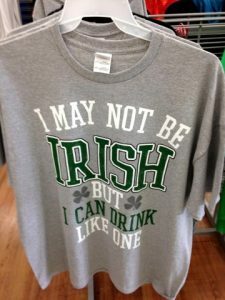 We also note that a shirt with a phrase almost identical to that which Walmart is currently marketing, “I may not be an Irish Girl, but I Drink like One”, was previously marketed by another national retailer in 2010 only to be pulled when the Irish American community protested then. It appears that Walmart is stuck in a time warp with merchandise from 2010 and a view of Irish Americans from the 19th Century of the “Know Nothing” Party. The Ancient Order of Hibernians is calling for Walmart to cease the sale of this merchandise defaming Irish Americans immediately and to issue a formal apology to all Irish Americans via their website. We call on our 40,000 members, their families, the Irish American Community and our fellow Americans of all ethnicities to send a clear message to Walmart that there is no room in the America of the 21st century for bigoted ethnic based stereotypes no matter who the target is.